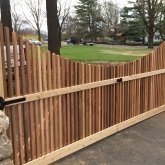 People in Newtown, Connecticut who need a fencing service can count on the professionals from Roots Landscaping for quality service. 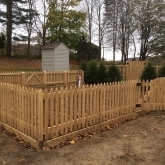 Throughout the years, Roots Landscaping has successfully completed numerous small and large fencing projects in Newtown. In fact, those who drive through Newtown on a regular basis have probably seen one of the company’s fencing projects in progress. There is a seemingly limitless number of choices from which to select in terms of fence types. To start, homeowners and business owners should determine the main reason they want a fence, such as safety, noise reduction, security or privacy. Regardless of the purpose for the fence, Roots Landscaping is available to help the residents and businesses of Newtown make their fencing project ideas come to fruition. 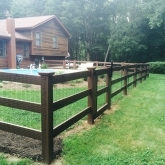 The fence partners of Roots Landscaping offer impressive and quality fences. Click here to find out more information about the company’s preferred fencing products visit here. 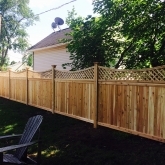 The experts at Roots Landscaping are skilled at installing various types of fences. 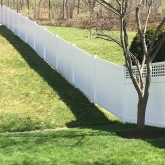 When it comes to fences, it is recommended that homeowners and business owners use a knowledgeable professional to install their fence due to the possibility of unforeseen elements, which can prove difficult to maneuver. Once Roots Landscaping and the property owner discuss the types of fence that are well-suited for the owner’s property, one of the company’s installation experts will analyze the terrain, measure the area and ensure the project runs smoothly. The cost of the project will vary according to the fence’s material, length and height. Roots Landscaping also has years of experience in repairing existing fences. The professional fence experts at Roots Landscaping can help property owners pinpoint the problem with their fence, and they can advise owners on the best repair approach. Roots Landscaping can perform a multitude of fence repairs, including rotting wood, holes, cracks, missing boards and collapsed sections. When a fungus eats a wooden fence, the wood begins to decompose. Unfortunately, wood rot is a common issue in fences. To combat this problem, the affected area of the fence must be chemically treated and patched. Then, the treated fence needs to be stained or painted. In severe cases of wood rot, it may be necessary to replace the entire board. 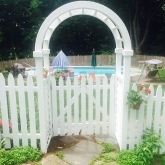 Roots Landscaping is Newtown’s go-to fencing repair and replacement contractor. Fence poles are structurally necessary because they give the fence stability. Over time, fence poles naturally shift. 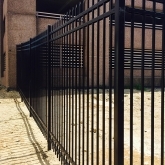 Therefore, if fence poles are not replaced periodically, parts of the fence may deteriorate or fall, which can cause the fence to sustain significant damage. The most effective way to get the most life out of a fence is to replace and repair fence poles as needed. The repair process for holes and cracks varies according to the fence’s material. For example, the process is different for a wood fence as opposed to a vinyl fence. To stop damage from spreading and maintain the fence’s condition, cracks should be filled and holes should be patched. Another kind of common fence repair is missing boards. The repair process for a missing board is determined by the fence’s height and type as well as the board’s length. The sooner a missing board is addressed, the more likely a costly fence collapse can be prevented. Property owners should contact Roots Landscaping now to discuss repair options for their fence. 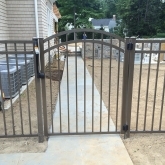 Roots Landscaping is a high-rated fence repair and installation contractor in Newtown, CT, and the company even offers landscaping and masonry services. Anyone who needs help for a fencing project or wants to know more about the company should get in touch with Roots Landscaping. The company invites homeowners and business owners who are interested in any of the services provided by Roots Landscaping to call 203-304-7326 today. As a top-tier service provider, Roots Landscaping is fully accredited by the Better Business Bureau. To find out what Roots Landscaping can do to help homeowners and business owners achieve their landscaping goals, property owners should contact us today or call 203-304-7326.